Dosa is a very popular South Indian Breakfast dish. Now a days, we try out so many varieties of dosas like Set dosa, Masala dosa, Tomato dosa, Neer dosa, Oats dosa, Ragi dosa, Wheat dosa and so on.. A lot of Dosa camps are setup these days in Bangalore and its fun to hang out there with friends and families especially during rainy season to enjoy those yummy tasty HOT dosa's. 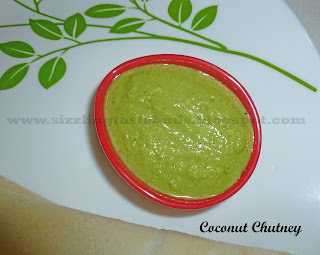 And what better combination than an all time favorite dish Coconut chutney. 1. Soak Urad dal, rice and fenugreek seeds for atleast 4 hours and make a smooth batter out of it by putting it in the blender. 2. Mix once and allow it to ferment over-night. 3. Add Salt and mix thoroughly. 4. Heat dosa pan and drizzle it little oil. Take a laddle full of dosa batter and pour it in the middle and spread it in concentric circle. 5. 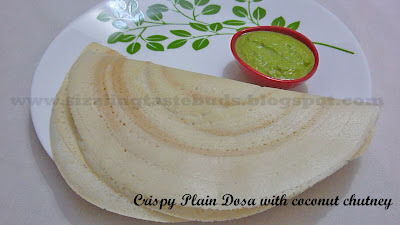 Crispy dosa is ready to serve. 1. Blend all the above ingredients together to a smooth paste and add salt. 2. Coconut chutney is ready to serve. Usually coconut chutney won't be so green in color. I added little more coriander leaves while grinding, hence chutney turned out green.